Most of us hate flying. From delays to TSA lines to smaller and smaller seats on flights, flying is not what it used to be. Many of us enjoy the ease of using Uber on the streets, but when it comes to the skies, the airlines—no matter how terrible they treat customers—appear disruption proof. Until now! Enter Surf Air, an all-you-can-fly private membership that provides business and leisure travelers with exclusive, hassle-free air travel. Today we talk airline industry disruption. 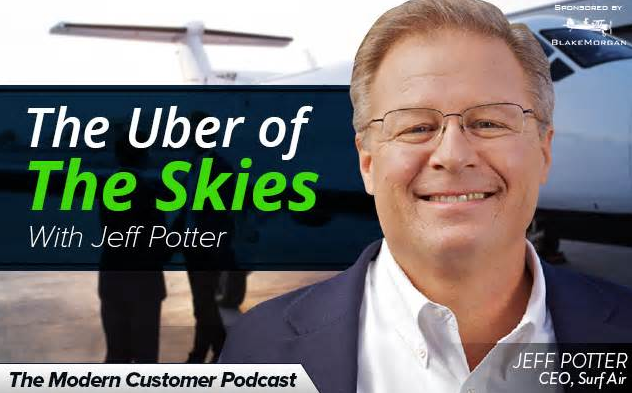 Today on the Modern Customer Podcast, we’re joined by Surf Air CEO Jeff Potter, who talks about the Surf Air customer experience. Starting his career as an airplane cleaner, Potter eventually worked his way up to becoming President and Chief Executive Office of Frontier Airlines and a member of their Board of Directors during Frontier’s greatest growth period. He also held the Chief Executive Office title with Vanguard Airlines in early 2000. As CEO of Surf Air he oversees all operation and is instrumental in helping Surf Air to expand into new territories. His combined stellar aviation background and luxury product experience as Chief Executive Office of Exclusive Resorts makes him an invaluable part of Surf Air’s success. How does Surf Air create a unique and exclusive environment for guests? What are the disruption opportunities in the airline industry?